Truck driving can be a rewarding and prosperous career for many people. It offers a valuable service to companies in all industries and is a key factor in the growth of the economy. In Canada, the truck driving industry continues to grow as it does in other countries around the world. The individuals who drive transport vehicles and heavy equipment continue to be a vital need for all businesses, and acquiring the knowledge and skills to be a truck driver is the first step to embarking on a truck driving career. 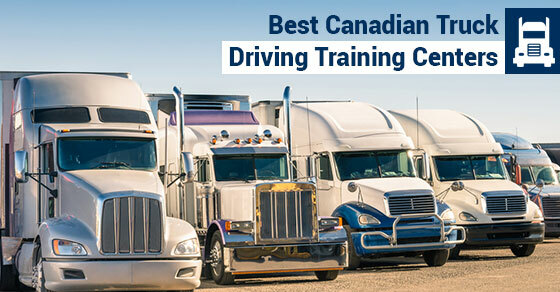 The following are the best Canadian training centers for truck drivers. JVI Provincial Transportation and Safety Academy is recognized for its high-quality instructors and training. This has made it one of the most recognized training centers for truck drivers in the nation. They offer a wide range of courses that meet the needs of individuals, employee groups, and corporations. Classroom and behind-the-wheel training are combined to ensure that students receive the highest level of training to prepare them for a career in transportation. The organization offers courses related to the transport of dangerous materials, workplace hazard materials, and professional driver training. Thompson Rivers University’s (TRU) professional driver training is backed by more than 26 years of industry experience. They have a highly skilled staff that provides students with training programs that prepare them to work with the many trucking companies that are looking for skilled drivers. Students of TRU’s training program are sought after by companies in Alberta and British Columbia, and their job placement assistance programs ensure that students have a greater chance of working with some of the top transport companies in the industry. Ontario Truck Driving School has been recognized as one of the leading training centers in the nation. As a registered private vocational center, Ontario Truck Driving School offers a high level of training services for truck driving and heavy equipment operation. Their instructors are highly qualified to teach you how to address the many aspects of a truck driving career. The training center has more than 50 staff members who work together to ensure success and a long-term career for students.Students are also fully prepared with the training they need related to crossing international borders. This has come about as a result of an increase in transportation between Canada and the United States. Finding the best Canadian Training centers for truck drivers is essential to starting a career in this industry. Students must consider a wide range of factors when deciding where to obtain their training. These are 3 of the best, and will no doubt provide you with the resources you need as you begin your career in truck driving.